This 3D model, manufactured in 2011, is at a scale of 1:50,000 suitable for district level planning. It measures 2.14 m x 3.29 m which represents 16,464 km2 on the ground. 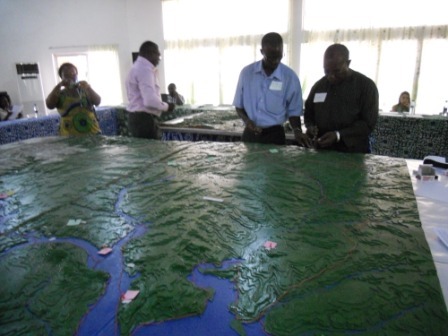 It has a vertical exaggeration of 2x and contour interval of 25 m. The model features portions of nine other districts being Tamale Municipality, Yendi, East Gonja, West Gonja, Bole, Tolon Kumbugu, Savelegu Nanton, Kintampo North and Sawla-Tuna- Kalba. It was manufactured in the framework of a Canadian International Development Agency (CIDA) supported project to raise awareness on issues related to climate change, related increased flooding risks and for the need to address such risks at the Regional, District and Community level. This is the second of a series of two models which were done in Ghana in 2011. The first one covers the Northern region of the country.